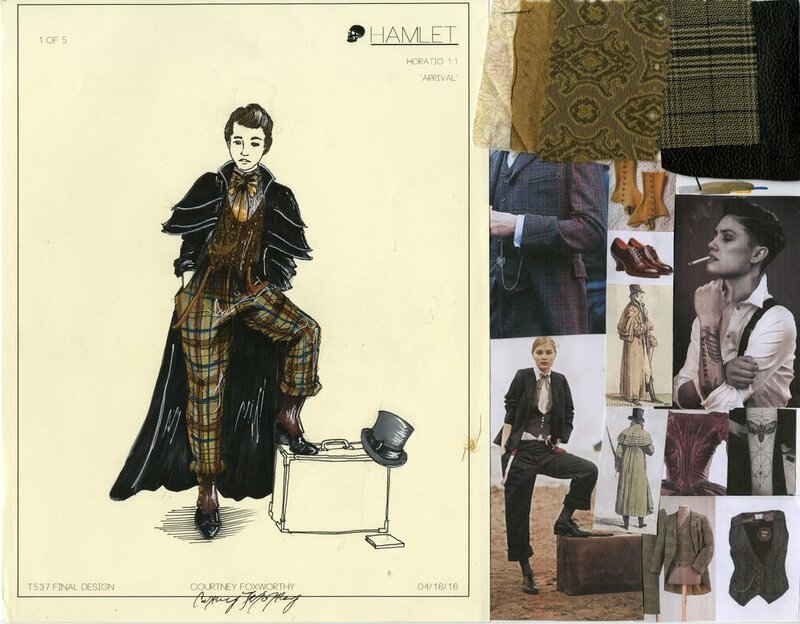 Theory based final costume design project. Designed in the style of "Gothic" with late 1800's , dark fairy-tale, and modern influences. Some characters are gender bent to help tell the story and explore the question: Are only male characteristics viewed as powerful, and what kind of power do woman have in classical story telling? Hamlet, designed as a female, begins the show by following traditional gender roles in her society.This is shown by her wearing a lavish long gown to court. 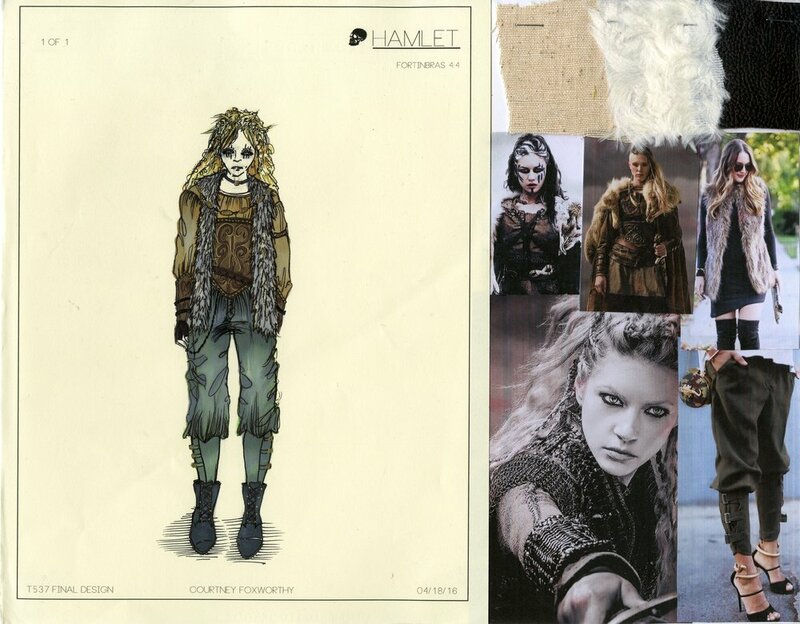 As the plot progresses Hamlet becomes more and more masculine and disheveled as she gains power, concluding with her dresses getting consistently shorter and her wearing trousers by the end. Ophelia, designed as a male, begins the show by following traditional gender roles in his society, though the silhouette is soft, and the colors more feminine, this outfit would still be appropriate for men. As the plot progresses and Ophelia looses power and control, he becomes more feminine. He is last seen in a spin on the classic white nightgown so often seen in productions. Ophelia was designed this was to pose the question is power purely male in these stories, or masculine traits? Gertrude designed as a male. Claudius designed as a women. The concept being, what different kinds of power is there, and would the kind of power Claudius had change based on the gender of the charter? With this idea in mind Claudius starts out having sexual power though using her body to manipulate the men around her. As the story progresses she starts to become more powerful in a traditional seance and because of this her costumes become more structured, intricate, and less revealing. She was inspired by Gothic architecture, high fashion, and ravens. Horatio designed as a female. Though she would be played by a small female actress, she would have a vary masculine androgynous appearance similar to that of men in the 1800's. Playing with gender standards, when the character is at an official event she would dress famine, but when she were in casual clothing she would be dressed more masculine. The character would act as a though-line narrator and author, ending the show by writing in her journal, documenting Hamlet's story. Rosencrantz and Guildenstern designed as twins, one male one female. They would both be androgynous in appearance. The Actors. Animal masks would only be warn when the play is being performed.